Today we are doing seasoned potatoes in our other Solar Hot Pot (see separate post for recipe) simultaneously with this meatloaf. They have similar cooking times, so that makes it convenient! 9:45 am—preheat Solar Hot Pot by putting lid on and setting up facing the sun. Set timer for 15 minutes. Cover it all with ketchup. Put baking rack in top and thermometer through baking rack to touch the middle of the meat. Cover, set up facing the sun, set timer for 60 minutes. 11:00 am—adjust to sun, set timer for one hour. 12:00 pm—check temperature; needs to be at least 150 degrees Fahrenheit. See if you can tell if meat is done. This might be tricky! But, better to go too long than too short as long as it’s up to 150 degrees. 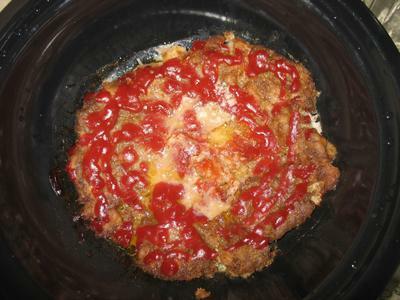 It is difficult to burn food in the Hot Pot, and it’s also hard to “overcook” meatloaf. If not sure, adjust to sun and keep checking every 30 minutes to see if you can tell what’s happening.